Ukrainian President Petro Poroshenko, who is running for re-election, has promised to respect any choice of the Ukrainian people, whoever wins the second round, which is due to be held on April 21. 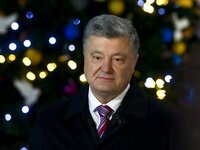 "If, God forbid, he [Poroshenko's rival Volodymyr Zelensky] was to be elected, that would be the Ukrainian people's choice and I will respect it, whatever the choice," Poroshenko said when asked by a reporter whether he is ready to cooperate with Zelensky if the latter is elected president. Earlier on Sunday, Poroshenko arrived at central Kyiv's Olympiyskiy Stadium for a debate with Zelensky. Poroshenko emphasized that he had never called his rival a drug addict. "As for possible drug addiction allegations, I have said it three times and I say it for the fourth time now: I have no evidence that proves that Zelensky is a drug addict. And therefore, I never, I stress, never call him that," Poroshenko said, adding that he takes a very responsible attitude towards his statements.